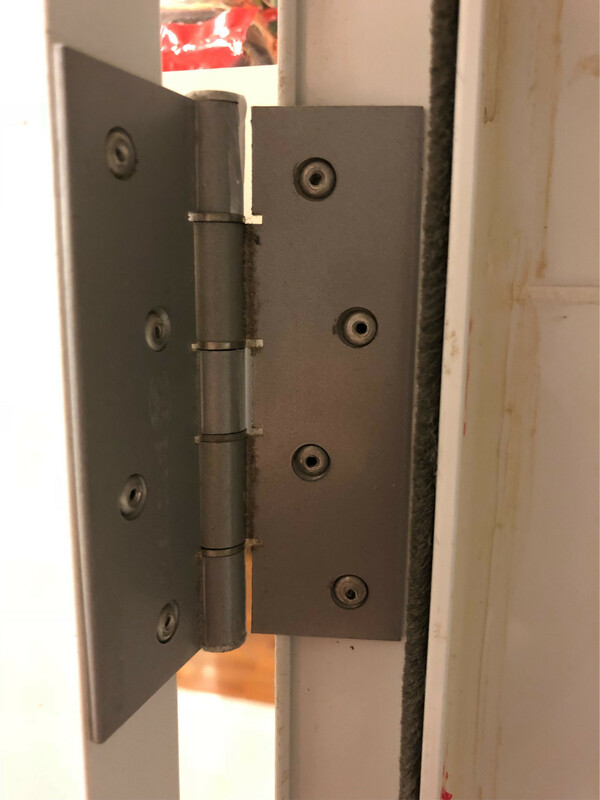 Just moved into a new apartment and one of the doors is mounted with these fasteners I’ve never seen. I’d like to take this door out, but I’m struggling to figure out how to remove these without breaking them. Looks like they used rivets. The only way to remove them, is to destroy them (drill them out). Those look like rivets to me. You can simply drill the rivets out to release the hinge, however reinstalling the door could be complicated. A simple solution is to drive out the swivel pin from the center of the hinge. Look under the bottom of the center swivel joint. There you should find a hole into which you can insert a 16 penny nail or equivalent. The pin will drive up and out. Called 'pop' rivets in the UK, also 'blind' rivets, since you don't have to have access to the other side on the part receiving the rivet. Be careful drilling out, as the centre pin is steel, and the rivet is aluminium. If you drill out too large, and wish to use the same holes, you can have problems finding a suitable replacement. 1/8" is a common size, but these look larger. A (usually) reversible way to remove a door is to drive out the hinge pins. Pry off the bottom caps and then from below insert a "drift" or a large nail and tap with a hammer. Before prying off the bottom caps try inserting a thin drift into the hole in the bottom and pushing the hinge pin up far enough that you can get screwdriver on the underside of the top of the pin. Not the answer you're looking for? Browse other questions tagged doors door-frame fastener or ask your own question. How do I replace a door hinge with no screws? Am I required to have a doorknob lock on my exterior door? What are these doorstops called?